The plunge into the world of poverty is palpable. You feel it, as sharply as a sudden dousing of cold water or a plunge into a cold pool. The jolt is particularly strong nowadays because most aspects of our lives are arranged in ways so as to exclude or hide away the discomfort of dealing with the strain and injustice that poverty reminds us of. Entering La Carpio felt that way… like I was, yet again, plunging into a new world. On my first visit to La Carpio you could see the differences, you could smell and hear the differences… but most of all, you could feel a sharp transition between the twisted dirt roads of the shantytown and the straight, mathematically angled neighborhood roads of the middle-class residential area we’d left. Poverty often has a “you know it when you see it” sort of definition, which is actually quite useful given our mind’s ability to identify differences and contrasts. The material differences are quite marked, and are the first things you notice when entering a shantytown. In Costa Rica, unlike the United States, the racial distinctions are not so clearly marked, so to some degree “race” or “ethnicity” is held constant across differing levels of material affluence. This is not the case with nationality nor birthplace, however, as slums will be disproportionately filled with workers from outside the city and from neighboring countries of poverty. I would later discover this nationalistic split and be reminded again of my tight connection with both Haiti and Nicaragua. Nicaragua had always interested me because I had seen it listed as the “second poorest country in the Western hemisphere after Haiti.” After living 10 years in Haiti and seeing the “poorest (and third most corrupt)” country in the Western hemisphere, I had always been curious to see what the “next step up” looked like. It is a stark contrast, but what demarcates it so clearly as “poor” is the jolting difference between the surrounding affluence, especially in Costa Rica. At first glance and from a rudimentary knowledge of Nicaragua and Costa Rica’s history, the reasons for the contrast are pretty easy to see. The country of Nicaragua has been wracked by civil unrest, foreign interests pursued violently, degradation of the land, instability of the government, and natural disaster. Their “emergence” from violent civil clashes occurred in the 80’s, as opposed to Costa Rica in the late 40’s. This explains a lot of the material inequity between Costa Rica and Nicaragua. What gradually becomes apparent, though, are structural reasons La Carpio appears the way it does, as well as symptoms of political economic injustice. Its plight is a combination of meager material capital from the outset and structural oppression from the surrounding society. This has been documented in various ways through interviews, critical reviews of news sources, environmental justice concerns, and most strongly from issues of unequal education and a growing dual labor market pattern. It is exhilarating to visit the Quetzal Educational Research Center (QERC) because I feel my heart “strangely warmed,” to hear all the lectures and interesting topics they are learning. I pour over the books in the library, too, several different “ology” sections, journals of research, field guides to animal identification – and my favorite, the sections on culture, history, environmental stewardship, and the “care of creation.” Here, actually situated in a tropical cloud forest, these books and topics light a fire of intrigue and curiosity in my heart. Because here, you walk outside and see the birds and plants on the pages of the book, you smell the loamy earth, you experience them. Nothing is a more persuasive argument to me of the need for conservation and care of creation – even reverence – than experiencing the incredible lush eco-smorgasborg of Costa Rican cloud forests. The scientific research only makes it that much more sensational. When I hear visiting scientists or students talk about species we see I feel like I am a kid making peanut butter and jelly in the kitchen of Chef Ramsey, making macaroni and cheese in a world-famous Italian restaurant. Yet, I am the resident chef… it’s just so humbling that I get to live in this incredible country, this ecological paradise, yet I know and “appreciate” so little, scientifically, about the incredible biological treasures I am seeing. Coming to QERC restores my soul. The issues in the city take a steady toll on it. If technology is so robust and versatile, and can penetrate with a relatively small footprint into places like this, why do so few people actually use or work from contexts like this? If I truly work remotely, why can’t I do it from here? Why am I so blessed? Every evening I watch a spectacular explosion of color over the western horizon as the sun sets over the mountains. I walk to work in the morning listening to the twirling trills of the Ygirro (clay pigeon), the country’s national bird, and the “Cristo Vive” bird. I see several varieties of tanagers, I even saw a blue morpho butterfly once. I’ve seen howler monkeys from the road (outside the city), as well as a quetzal from the road up at QERC, a sloth in the mountains around San Jose, and a kinkajou from the porch of my hostel. Those all in close proximity to places where humans live and travel – that’s not even mentioning when you hike into the holy of holies, deep into the jungle where there areno roads, no electricity, and few people. Whether you leave the beaten path or not, Costa Rica has guarded its non-human nature and allowed it to live side-by-side, and sometimes “inside,” where the people are. This is a good thing. I say this coming off the wake of a semester class on environmental anthropology, which, to say the least, is not as optomistic about the relationship of humans to the environment. In fact, for my final projects I covered two sides of the coin in Costa Rica – ecotourism and conservation, which I just described, and the destructive results of increased human traffic and consumption – ie, pollution and deforestation. I’ll sum up the two reports with an interesting story. While staying at QERC I bought a T-shirt at the gift shop with the silhouette of a quetzal on it. It is not a cheap shirt, as t-shirts go ($20). On the sleeve it boasts that it was made from completely eco-friendly textiles and 0% sweatshop labor. It’s one of my favorite shirts. 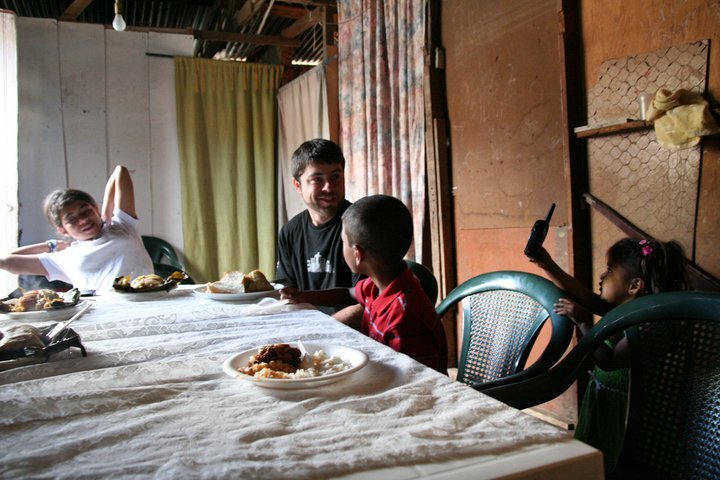 I wore it one night when I went to spend the night with one of my favorite families in the La Carpio slum. (I get tired of describing the place as a “slum,” but I will use the word again just as a description of the living standard there). Anyway, while playing “landa” (tag) with the kids in their “yard” (the street) someone grabbed at me and tore a hole in my favorite quetzal shirt. The family was mortified and replaced it immediately with an Abercrombie and Fitch shirt, which has symbolically become another favorite shirt of mine. It fits me perfectly, and is a more discrete, hidden symbol of my concern for social issues. The point of the story is this – as much as I love the experiences, the restoration, and the beauty of places like the Savegre Valley that strive to balance humans and nature, that reality as a utopian cocoon of conservation is a myth that gets torn straight through the moment you visit a place like La Carpio. Costa Rica claims both the cleanest and most polluted river in Central America. The cleanest flows through the Savegre Valley. The most polluted is fed by several upstream rivers that eventually merge into one – two of these rivers flow straight through the heart of San Jose, untreated, and encircle La Carpio at the end of their route before merging and dumping, untreated, into the ocean. The far end of La Carpio was chosen as an “Environmental Technology Park” (a garbage dump), which gets 1500 tons of the city’s garbage every day (I find out later that people outside these areas actually believe they are “parks”, because when they are filled up they are disguised as lush green hills). 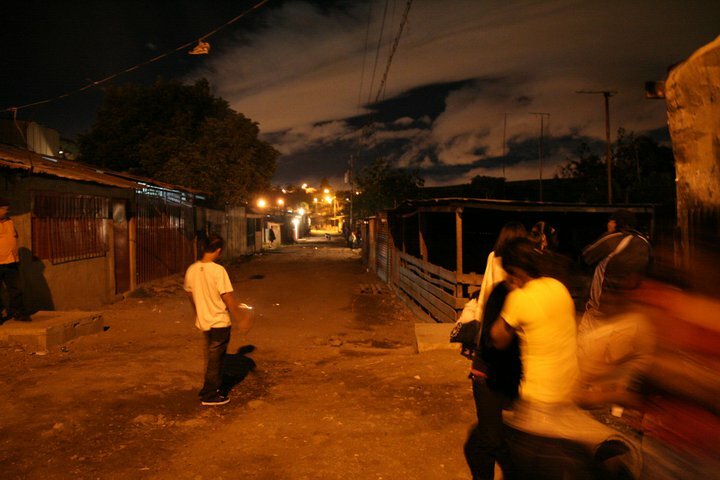 This – the material result of urban concentration and overconsumption – is geographically located in the exact same location as the sociological result of greed, prejudice, and stigmitization, where what is “poor,” “illegal,” “foreign,” and “undesirable” to Costa Rica’s national image is swept into. It’s about 5:45 A.M., morning of Christmas Day, and gray dawn light is starting to illuminate the cracks and holes in the tin walls. The morning is quiet, and I quite enjoy the tranquil afterglow to last night’s ruckus in the streets, the persistent reggeton and club music from across the street punctuated, until I fell asleep at about 1 A.M., with the crack of firecrackers, bottlerockets, and the hiss of roman candles. The persistent noise now is the roosters, like a chorus outside, almost thick with the noise of animals. Thankfully there are none nearby, but you can hear over a dozen throughout the streets crowing in waves like ocean sound on the shore. I heard people mumbling at about 5:30 A.M., outside or in an adjacent house. The house is quiet here. I can hear the kids through the thin centimeter-thick sheet of wood separating us. I think ME has the nasty-sounding hack-cough (correction, it’s UL). LO is sleep-moaning or something. The periodic breath of wind outside can be heard strongly in the street, but doesn’t seem to move the house much. As far as I can tell, the strongest structural element of the house is a few 4×4 beams embedded in the cement, running vertically. Most of the other partitions are made from 1-cm thick wood. I see now that some walls are made of thin wood. Some of tin. I stumble out to find the bathroom. I see that the kitchen has a light on still. It provides some night light through the top of the house, which is not divided. The soft bulb light is quickly drowned out by the dawn. The center section of the house, the part with the running water (washing machine, toilet area, and spicket) is already lit with gray light from outside. OM is up. He met me as I left the bathroom and asked if I wanted to watch T.V. I told him I wanted to rest more, and by rest I mean enjoy a few more peaceful moments of solitude before everyone comes alive. I can hear that Sis up, and AD is talking softly with her. This home is like some sort of a suite, partitioned off differently with several shared spaces. I am the only one with a single room. AM and AN sleep here, usually, I believe. AM is 17 and her daughter AN is a few months old. She is in Los Chiles with AC and OJ. She was just born when this family homesteaded here from Nicaragua in 1993. They are one of the first five families here. AM-GM, the matriarch, speaks of how much better things are now – with running water and electricity. Back then, times were hard. Once a week the women would go down to some sort of water source past the garbage dump to wash. They now have a spicket delivering water to the center room. I would call it the utility room. I was quite proud of myself for being able to figure out the bathroom. (People are up now, whispering in the front room. S, M, and D I think). The first rays of sunlight, golden sunlight, slicing into the top of my room. There are no doors here. The partitions are separated by thin curtains. The bathroom door doesn’t lock. Somehow M knew to wait for me to come out, probably because the door is so rusted and decomposing that you can see into the bathroom. I’m really curious about the protocol for bathroom use. Like in the house with my host family, I feel like a detective putting a puzzle together. I look around for clues as to how to use the commode. What is the wooden hook above the toilet for (it’s the TP holder)? I listen now, from my bedroom to hear how the bathroom is used. I count three bowlfuls for a flush. I only used one. I think I heard 8 bowlfuls for a first washing round. Now I think I hear the big blue plastic barrel being moved. To be refilled? Same as in my host family’s house, I listened from outside the door for clues as to how to bathe and use the toilet. If I remember correctly, Paul Farmer wrote that poverty is written in the kitchen and the bathroom. That is where you will find the effects of social inequity inscribed. I think that observation is quite astute, as well as the connection to embodiment of the effects of poverty, the link with health and hygiene, clean water, and waste removal, food and cleanliness. That is, where the body is cleaned, purged, the kitchen is where the food that enters the body is prepared. It also seems that men may be involved in the creation and architecture of these key spaces (I’m not sure about that, but I assume it). Women are in charge of its maintenance and use. I also noticed that none of the kids brushed their teeth. AM-GM mentioned to me she has no clue how to drive. Can’t read, either. She knows her alphabet, though. The other thing that concerns me is the open containers of standing water. I read about these in an anthropology article about slums in the D.R. Standing water, like those in the huge plastic drums, create problems and higher risk because of mosquito breeding – malaria and dengue, I think, are the two resulting concerns. The mosquito buzzing in my ear this morning more than just annoyed me; it concerned me. It’s actually no different in San Francisco de 2 Rios – an occasional or nightly batch of mosquitos in the room is not uncommon. (Turns out there are several articles about dengue outbreaks in La Carpio). I wonder, though, about the other observation I’ve read about in relation to poor urban settings. It is often the case that for lack of unified organization, lack of knowledge, lack of mobilization, lack of power and influence, and more disturbingly, for deliberate decisions on zoning and city planning, because of prejudice and dehumanization, because of economic pressures implicated in a free-market economy and the need for employment, because of deliberate neglect and oppression of vulnerable, powerless clusters of people not fully recognized as people – for all these reasons and more, it has been observed that lower class sections of the populations are often subjected to the harshest living conditions and most dangerous environmental hazards. They live near rivers, near garbage dumps, on dangerous slopes, in dusty polluted areas, etc.. La Carpio – case in point. All that just to explain… I am more concerned about things like mosquito bite, nail scrapes, coughs, infections, and seemingly benign symptoms here than in a place like San Fran 2 Rios. The concentration of humans and pollution run through worries me as well. All aspect of health and cleanliness seem intensified. As do pressures on the home and family. I’ll explain in a second. Poverty is a small ax, that can chip away at the strongest, tallest of trees. The religious idea of poverty as a sin, of structural violence, etc… has something important to say here, something people tend to greatly oversimplify and reduce to convenient truths. Poverty may not be the great sin, but it is a sin, a societal sin bringing us all sorts of symptoms of crime, drug use, domestic violence, health issues, depression, work-aholicism, and general issues of societal atrophy that choke the life from sections of our neighbors and fellow believers. All of society is guilty of perpetuating this inequity; it is certainly not a sin centered on the shoulders of the poor. At best they are victims in the situation; at worst they are accomplices, but not likely the main creators of it. Last night we had a worship service in this house. With the booming music outside and cracking of bombas, we sang, read a passage, prayed, and some guy preached. It was the first time I understood the purpose of the mysterious sound equipment in the front room. Which, incidentally, was purposed to either fight the outside ruckus or try and be some sort of testimony to the outside, or sound of joyful noise to heaven in the midst of the chaotic pounding bass. The house is uncharacteristically void of Christmas ornamentation. Essentially, there is nothing symbolic that points to any trace of the season. Other houses have lights, wreaths, Christmas trees, etc… A friend mentioned to me how fascinating it was to see the myth broken of how the poor are not interested in those sorts of frills, but merely concerned with survival. It’s not true; they are intensely invested in not just survival, but in living well, and particularly in enjoying family time during the holidays. The lack of decorations in the house I’m staying in may have to something to do with a fundamentalist flavor of Christianity, a mentality that I caught a whiff of last night from a comment the visiting preacher voiced regarding the pagan, worldly use of a Christmas tree, which was clearly unrelated to the true meaning of Christmas, but can be tolerated nonetheless. He also talked about how the magi’s visit flip-flopped the normal hierarchy of the day – rich, powerful, learned men kneeling in the home (not stable) of a poor couple in worship and deference and awe of their little, powerless baby. He’d done his homework. Or at least read the passage for what it said. I have mixed feelings about the presence vs. total absence of traditional Christmas symbols. My view sort of reveals my obsession and preoccupation with commercialism. But it clashes with my enamoration with culture. I like the refreshing lack of commercialist Christmas, and consumerist greed. It is a breath of fresh air. We do not open presents that night nor the next morning (although each child proudly shows me a paper bag of broken second-hand toys they’ve received early on Christmas Eve). But I miss the symbols, the rituals, the customs, the “culture.” I feel like this sort of thinking is what often makes me shut my mouth on my views about things. I feel that to open it, I am bound to say two truths – one that people applaud, and one they will disdain. And, as is the nature of things, they will forget quickly what they agree with me on and remember the differences. I suppose I am ashamed that I also greatly reduce reality to fundamentalist convictions, both socially and morally. I don’t often connect the dots or bother to explain why the commercialist-consumerist-competition-free-market mess angers me. And why I so strongly react to it. I also idealize without appropriate rational critique the fundamental benefit of strong morals, tight families, respect of tradition and custom, and the threat of traditionally feared threats on holy living – addiction, drugs, alcohol, assimilation, etc… And, I love classic Christian practice – prayer, worship fasting, renunciation, discipline, celebration, sharing of things. Anyway, no matter how you look at it, I am bound to offend someone. OM comes into my room through the curtain. The doorways to the rooms inside the house are only divided by a thin curtain. AD is washing clothes. Starting coffee. The kids are mostly still asleep in the room beside me. I hear S, M, and V as well. OM just watches me for a few moments, then runs off. What I’m doing is boring. It is also quite meaningless, I feel, until/unless I ever get a chance to share it with someone else, which I may or may not do. This morning I reviewed the basic layout of the “complex” we’re in. Like I mentioned, I am in a room by myself, where M and N (and the husband?) normally sleep. Next to me through the thin wooden wall are S, O, E, H, and E. Next to them, the “matriarch” (M), her husband, and L, their (severely) mentally handicapped child. Then, the kitchen. The front room space, with a table and chairs. The rooms are each about 4m squared. The front room shared space, about 4×6 meters squared. The kitchen, 4×2 meters squared. The kitchen is shared. The utility room is in the center of the two living spaces. It has standing water, the spicket with running water, a dirt floor, and is about 4×8 meters squared. It has tools, the sink, the 2m squared bathroom, toilet, and barrel. There is no tubed drainage. From the sink, from the bathroom, from all parts of the house, the drainage goes onto the floor and is sort of channeled out the back of the house. The toilet sewage is not exposed… it goes straight into the ground, and I assume is jetted straight out the back of the house as well. We are not exactly on the brink of the riverbank, like Q’s house. There are about 4 living spaces between us and the edge. Next is the living space of D and her family. The front room has a TV and huge speaker system. It’s about 4×8 meters squared. The kids and parents all sleep in bunks in the back – D and her husband, L(12), V (11), E (9), M (7), S (3), and D’s unborn child (she’s pregnant). All 7 of them live in a segmented portion of the house about 4×8 meters squared. At about 8 A.M. we have breakfast. Before that, the kids are all in D’s section of the house watching T.V. It amazes me, though, how people are able to watch TV in passing. I can’t. It demands my full attention. It’s really hard for me to ignore when it’s on. But while Toy Story 3 is on and all the toys are about to get incinerated in the dump, they loose interest and start talking. M and S walk across the street to a pulperia to buy a little bag of Dorito knock-offs before breakfast. M gives me a bag of them, but I really do not want it. I am so full, but I accept it and tuck it away for later. I am struck again by the precarious juxtaposition of childlike innocence and adults with impaired judgment. There are 12 people in the street this morning, with wafts of gunpowder (from the fireworks) in the air, and sewage from the milky white stream at my feet. I actually can’t smell any alcohol at all, which is odd because it was (last night) and still is so pervasive in the streets. Six of the people in the street this morning are kids, playing soccer and talking. Six are adults. The group of four in front of the pulperia is what makes me uneasy. A young boy and three men are joking happily, already (or still) nursing huge bottles of Imperial beer. It’s clear that any sense of judgment and forethought and concern has long since been lost to them. I stay close to the door of the house, watching S and M enter the pulperia. S walks through the group of men, peeking at me and yelling something happily from behind them. I realize that the men make me nervous. I feel safer close to the house. S, however, is totally unconcerned. Something about this “precarious juxtaposition” is disturbing to me, but at the same time more truthful. Sometimes, through zoning and different social clusters that we form, we can isolate ourselves and families from the insecurity of alcoholism, drug abuse, youth delinquency, etc…. Well, we think we can, but really, those issues are quite present for many of us. They are inside the suburban fortresses we’ve constructed. Like that Christmas night, those threats were on the street… and they were in the home. Sometimes I was afraid to stray too far from the house. Sometimes I was afraid to go into it. It is the women and the kids that suffer the most from these precarious juxtapositions, which are often the result of careless or violent behaviors of the males. We have got to shape carefully and patiently the behavior of young males, they often seem to be the ones acting out violently. There are lots of groups doing damage control in places like La Carpio. Very few walking, working, and living with those in the community, befriending and discipling them. Breakfast is a choice of Nacatamal or “comida” (rice and chicken). I can only barely get through another plate of rice and chicken, and bread, but I make it. My stomach is tired of starch-food. It’s getting harder to stomach it. It’s good, though. After that the kids took me to track down Q and F. I’m taking them into San Jose for my birthday party. F’s got his earbuds in… he’s pretty stoked, he finally hit 35 wpm, which means he earned the iPod mini I bought him in the States. Q will hit the target later today, and they will both have what they earned by the end of Christmas Day. Christmas Eve was the big day, though, though most of my reflections I recorded the next morning. I got to La Carpio at about 3pm. I met D on the main road with M. We put the car into L’s place and continued to the house. M and D wanted to go buy food, though, so we headed into Chepe once again into the thick of the central market. M and H latched onto me, one on each hand, the whole time. We wove through thin passageways, in and out of different carnecerias and fruit stands. The purchase of chicken was mysterious to me; we bought chicken at three different places. I wondered if they were places they knew, and if so, why we didn’t just buy all three chickens at the cheapest place. On our drive back, M explained to me that she couldn’t read or write a single word – all she knew was the alphabet. I should have been double-checking their math – people here don’t usually rip me off, but but they often make major calculation errors or oversights. I suspect that may happen more if they perceive their client to be illiterate or uneducated, but who knows. Grapes are about $3/kilo. Chicken – I forget, about $8 for the entire chicken. And we bought 3. We bought a huge jug of ketchup, and I cringed at the realization that ketchup would be the base of the sauce for the chicken and rice. They way people use mayonnaise and ketchup as sauces makes me nauseous. I took out my cell phone at some point discretely to reply to a text message. D warned me later not to take it out in the central market. I never take it out in San Francisco de Dos Rios, either. In La Carpio, I do, though. There is some security dynamic that seems lost to people. There are no hard-and-fast rules, but I can “intuit” a different set of rules for caution. In places like San Francisco de Dos Rios or the central market, I’m at risk because I’m a target (on the street), I’m alone (in SF2Rios), or I’m anonymous. In La Carpio, there is always the possibility that a vagabond youth might mug me, but less likely because there I am not anonymous. They usually hang out on the corners, and will probably only mess with people they don’t know, or don’t respect. Anyway, my point is, it amuses me to think of how many gringo missionary friends I have that walk in fear in their middle-class SF2Rios neighborhood, with good reason, yet, if they were going to some the marginalized places like La Carpio, they very well may be safer. That is, not targeted, if they learn the rules. We head back at 5pm. We play games and stuff until our little church service at 7pm. There are 15 people total – most of the kids, the three moms and I, Grampa, and a stranger preacher man. The service is uneventful, except that I finally discover the purpose of the mysterious sound equipment in the corner of the room. Of course, I don’t think sound amplification is necessary for a small group of 15 people in a room so small. It helps us compete with the cracks, pops, and incessant dance music from the street. In fact, I think the sound system is a competition thing… or a witness thing, announcing the presence of godliness in an otherwise quite disorderly context. The service is not long, only about 45 minutes. The chairs are then cleared and the table brought out. The next couple hours we rotate between table games, firecrackers, and games like tag and hide-and-go seek in the street. At some point right after the service, two of the kids take me over to L’s area so I can find Q. His mom invited me for some cake. That visit got uncomfortable quite quickly, partly because I saw lots of our guys largely wasted in some form or another in or around the pulperia across the street. The larger fireworks continue for a few minutes, but the actual midnight changeover is a bit anticlimactic for me. We don’t stay up much longer. I can barely keep my eyes open. I’m in bed by about 12:30. The street, separated from my room by merely a thin sheet of deteriorated plywood, is still alive far late into the night; for some, clear through to dawn. But the ruckus doesn’t bother me. Whether it’s sensory overload, or my own internal body clock, or culture shock, or what, I am out by 12:45, and I don’t wake once until dawn. That was a good Christmas. The next night, Christmas Day night (25th), I brought Q and F home at 10pm. The streets were vacant. The place was asleep. The lights were off. It was totally silent, except a small group of thug teens up by the public telephones that Q and F told me to avoid. A last comment – at no point did we “open gifts” or gather around the Christmas tree. Early the day before, the kids shyly showed me some small gifts they’d received – broken dolls and stuff… some looked very nice. And they showed me their new clothes they were “estrenaring” (“presenting” or “breaking in”). But, for example, even the gifts I brought we did not open. I encharged M with them. I had no idea what the protocol was for gift-giving.